The retail giant Amazon opened a new convenience store to the public on Jan 22nd, 2018 – “Amazon Go”. The grab-and-go store enables a shopping experience like no other – including no checkout lines. This 1,800-square foot mini-market is packed with food and technology – computer vision, proximity sensors and an array of cameras. The customer at the Amazon Go storefront downloads an app, connects it to their Amazon account and steps up a payment method. This generates a QR code on the phone that is scanned at the front station of the store. Ceiling-mounted cameras and sensors throughout the store track and charge automatically. Whether Amazon leaves this as a one-of-a-kind novelty or continues to grow these phenomenal experience stores, they have already spoilt the consumer for choice by exposing them to enhanced shopping experiences and hence disrupted the brick and mortar landscape. This is similar to how Uber disrupted the taxi industry by removing the friction and creating a better experience. To stay ahead of the curve, traditional retailers need to step up and power digital technologies in their stores. The goal is not to deploy an array of expensive cameras or sensors across the store, but to implement a cost-effective in-store technology that enhances and personalizes the shopping experience just as Amazon Go. 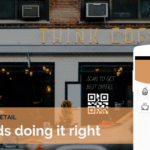 In this blog post, we will discuss how retailers can leverage beacons to beat Amazon Go, without spending millions of dollars on the infrastructure and technology. Beacons are a major part of the Amazon Go infrastructure. Its ability to connect with the consumer based on her location is way superior to competitor technologies. One of the obvious concerns with an infrastructure like Amazon Go is – the easier it is to shop, the harder it is to budget. Not every business would be willing to allocate the unusual budget that Amazon did. Instead, retailers can leverage beacons that cost less than $20 and are powered with batteries for a couple of years. The low cost coupled with the minimal efforts needed to deploy them makes it a cost-effective implementation of in-store technology. According to researcher BIA/Kelsey, location-based ad sales are predicted to grow from $12.4 billion in 2016 to $32.4 billion by 2021. While personalization based on third-party geolocation data remains elusive, the most accessible form of location-based advertising with sharper targeting comes with mobile geofencing. Given the seamless implementation of beacons, they are one of the best options for location-based targeting. Nudging consumers to download a brand app might not be a concern for a retail giant like Amazon, but it is obviously a concern for smaller businesses. According to a study by ComScore in 2017, around 51% of the consumers still don’t download any apps in a month. Beacon technology has been used for marketing for a long time, but the introduction of Eddystone has up the game for retailers. This is because, with Eddystone beacons, retailers do not need apps to communicate with their users. The Amazon Go store heavily relies on a vast and sophisticated data gathering mechanism. However, data gathering for retail stores can be easily achieved without arrays of cameras and sophisticated computer vision. One of the biggest benefits Amazon Go has is the added touch points with its consumers on the Amazon app. Beaconstac allows retailers to retarget consumers on Facebook and Google. Consumers who viewed any beacon offer notification in-store can be retargeted whenever she goes online. Statistics say, 26% of the users make a purchase when retargeted on Facebook. How to enable smart and personalized shopping experience with beacons in retail? With beacons, even small stores can create a big impact. Beacon campaigns should be well planned and structured to enable a smart experience for users. Among a plethora of successful beacon use cases in retail, there are few that can totally enhance the shopping experience of consumers. As Amazon tinkers with its physical store model, traditional retailers must work to provide new models and technologies to enhance the shopper’s experience. The low cost coupled with minimal effort needed in deploying beacons makes it an out-of-the-box and cost-effective solution to deploy and derive great ROI in retail.